Oakey Abattoir, located on Queensland’s Darling Downs, has launched an initiative to extract green energy biogas from its wastewater streams with a covered anaerobic lagoon. Energy generated by the anaerobic digestion plant will replace the millions of dollars worth of natural gas currently consumed by the abattoir. This is the first time the proven technology has been applied to a covered lagoon, an application where it has enormous further potential in countries with strong agribusiness sectors. According to Oakey Abattoir General Manager Pat Gleeson, once the plant has repaid its cost of construction through gas purchase savings (expected to take less than five years), it will then continue to deliver benefits and profitability far into the future. It was installed by environmental engineering and green energy firm CST Wastewater Solutions. The Oakey plant will feature re-use of the biogas in its boilers, where it is initially expected to replace usage of about 50,000 gigajoules of natural gas each year. “Yet another outstanding benefit is that anaerobic digestion produces reliable and predictable base-load power - unlike some other green-energy technologies, it is not dependent on the wind blowing or the sun shining,” said CST Wastewater Solutions’ Managing Director Michael Bambridge. 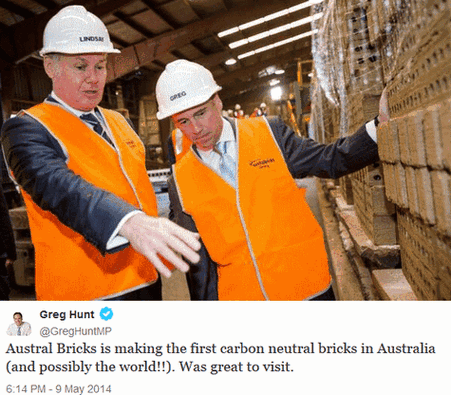 In a relentlessly negative campaign against putting a price on carbon, Tony Abbott the then leader of the opposition visited Austral Bricks in September 2011. Shortly after, Gerbilnow contacted Austral Bricks and suggested it assess renewable energy for firing its brick kilns. The use of waste timber in a gasifier for this process has two commercial benefits. The cost of fuel was substantially lower than natural gas. 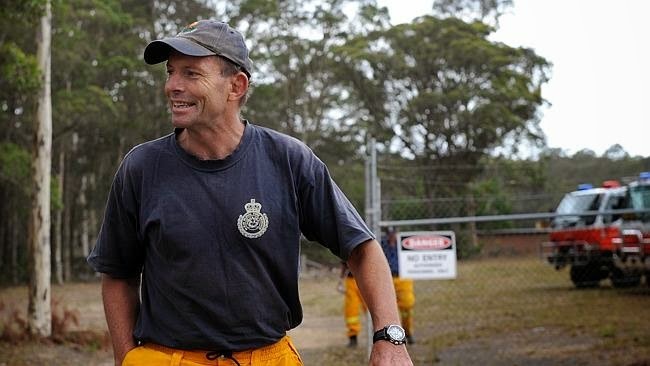 No carbon tax was payable. The carbon tax is an incentive to adopt such innovations. In particular it is an incentive to switch from fossil fuels to renewable energy sources. As a result of the switch the cost of new houses may fall as the cost of bricks can be lowered. Fast forward 2½ years to March 2014. Two different descriptions of Austral Bricks' innovation to become the first carbon-neutral brick manufacturer in Australia emerge. that the carbon tax has served as an incentive for positive outcomes for both the environment and the economy. Austral Brick’s national energy and sustainability manager Steven Mouzakis said the use of low emissions biomass as opposed to fossil fuels is largely responsible for the plant’s low carbon dioxide emissions. “Emissions from the biomass are just 215 tonnes per year, about the same as 12 average Australian households,” he said. Austral Bricks has ...found innovative ways of reducing these emissions. Steven Mouzakis, National Energy and Sustainability Manager of Brickworks Building Products, which produces Austral Bricks, said the company is delighted to have achieved a carbon neutral footprint for its range of brick and paver products manufactured at the Longford facility.